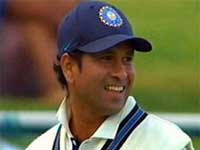 Indian batting genius Sachin Tendulkar got a little adventurous during a training session on Wednesday. He decided to shirk his right-handed batting status and switched to left. He faced about a dozen balls from local bowlers and his team-mates, biffing a couple of big hits as well from his disadvantged stance. Perhaps the move was a tribute to his former rival and West Indies batting great Brian Lara. But Tendulkar, who is known to be ambidextrous (as he signs autographs with his left hand sometimes) would not have found batting left-handed all that uncomfortable. But the real shocker was that he played his shots without any gloves on! The devout fan would cringe at the risk the Little Master put his knuckles through in batting without the proper gear. For the second consecutive day, Virender Sehwag didn't join the team for practice while Bhajji also sat out the day. Meanwhile, pacers Zaheer Khan and Ashish Nehra had light training session at the NCA gymnasium to strengthen their backs. Like Tuesday, Kirsten spent more time with the youngsters such as Virat Kohli, Suresh Raina, Yuvraj Singh and Yusuf Pathan.